Find out what career is right for you? 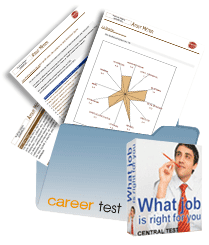 This test is based on John Holland’s RIASEC (Realist, Investigator, Artist, Social, Enterprising & Conventional) model of personality and career compatibility. This is a professional, scientifically validated test. For more information, including testimonials, click the link below. Your report from this test contains a detailed description of your work competencies, personality traits, social and emotional qualities, which will help you prepare for the questions that will be asked in an interview. 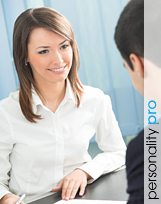 The Personality Pro Test has been developed and scientifically validated by Central Test, a leader in psychometric assessment with more than 3,500 clients and two million internet users worldwide. For more information & testimonials click the link below. “Do you dream of running your own company? Can you focus your strengths to achieve your goals? Are you self-reliant, innovative and ambitious?" The Entrepreneur Test will help you better understand your strengths and weaknesses and identify what it takes to succeed in running your own business. This test was developed and scientifically validated by Central Test. Central Test is a leader in psychometric testing with more than 3,500 clients and two million internet users worldwide.